Fitlink is specialized in developing, manufacturing, and supporting a wide range of consumer electronics products for Apple Watch, Fitbit, Huawei, Samsung and more. Through the past 7 years, Fitlink has become one of the most competitive companies with sophisticated production experience, strict testing procedure. Fitlink Fitbit Charge 3 genuine leather Bands are scratch-resistant, Not deformed, Not fade, No allergic reaction, Eco-friendly and safe for the human skin. 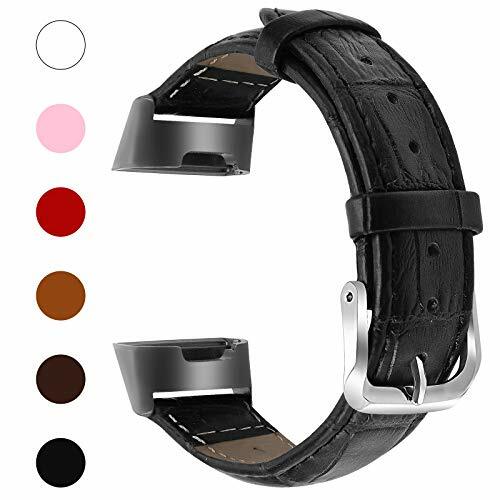 Adjustment stainless steel buckle : The lock Easily sticks and lock your watch band. Adjust the length of the tracker strap according to the size of your wrist. And holding your band tight and securely. Precision 316 stainless steel connector: Fit seamlessly into your Fitbit Charge 3 tracker interface and make you it stylish and elegant. Suitable for wearing in any place. Note: Leather goods cannot be soaked in water. If you receive a defective band or any other problems, please contact us any time, we will give you a satisfactory reply within 24 hours.